In Yogyakarta we Jalan, Jalan’d (walked) our way from the Casa de Raffles hostel down to the Belgian-Indonesian cafe of Via Via (recommended to us while we were on the tragic tour of Ubud and surrounds) and picked up our bike tour. 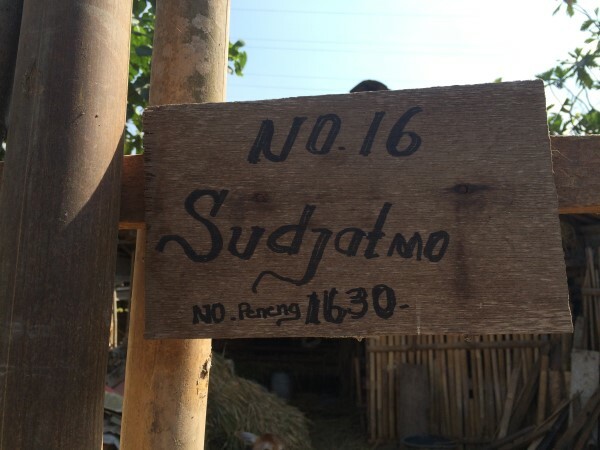 80% of the bike tours from this cafe-hostel-tour agency are taken by the Dutch, and our tour- the Javanese Villages by Bike was no exception, we joined a small group, jumped onto 6 gear road bikes and headed off into the Jogja traffic. “Just a short distance in the city” said our guide, at least waiting for us at the traffic lights. And she was right. 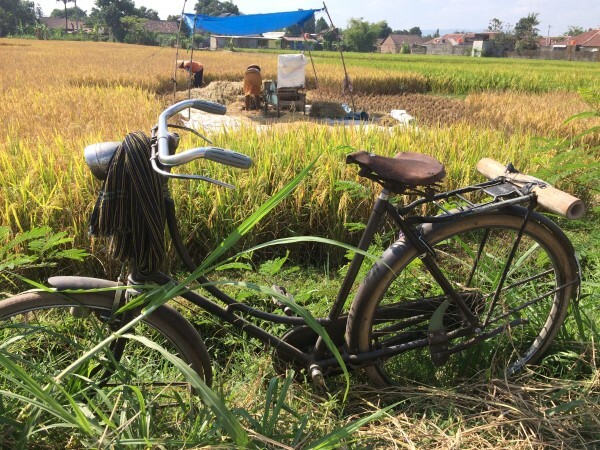 10 minutes later we were cycling along small empty lanes bordered by rice paddies, shaded by over hanging trees. 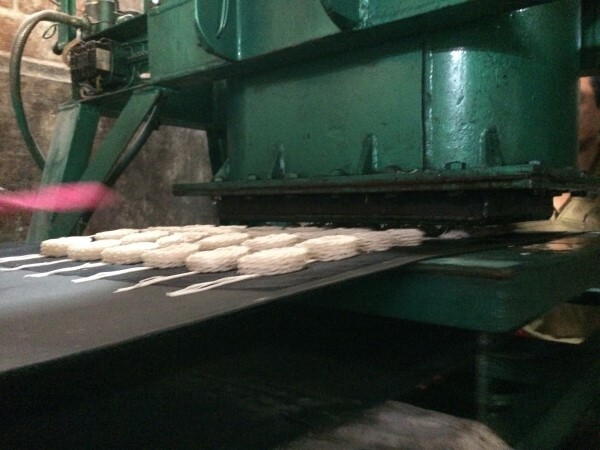 We’d get to see a little of the surrounding countryside, some local “factories” and get a little exercise too. Our first stop is a factory. Or what passes for a factory here in a sleep village just outside Jogja. 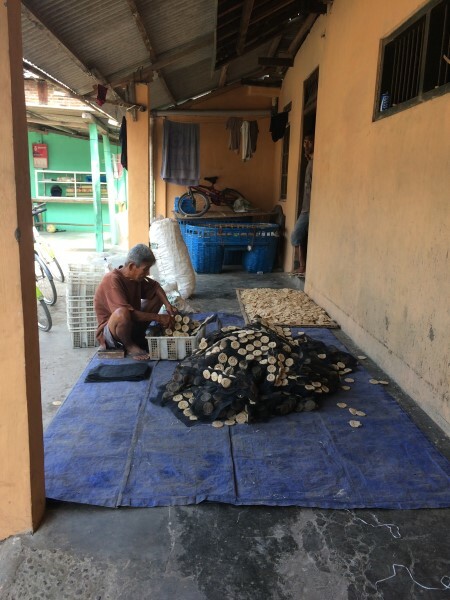 This is where they make Krupuk – those are the deep fried crackers that you see on EVERY table in a cafe, and in bags in stores throughout Indonesia. 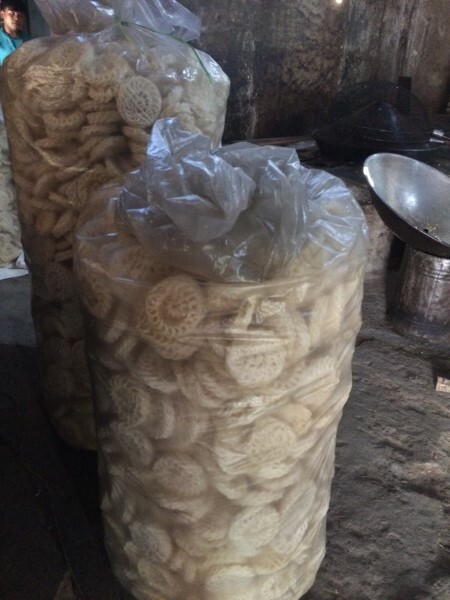 The “factory”is a series of sheds, where a local family are making krupuk throughout the week. The recipe is a family secret and highly guarded. Wikipedia tells us that the indgredients are “Starch and other flavorings”. 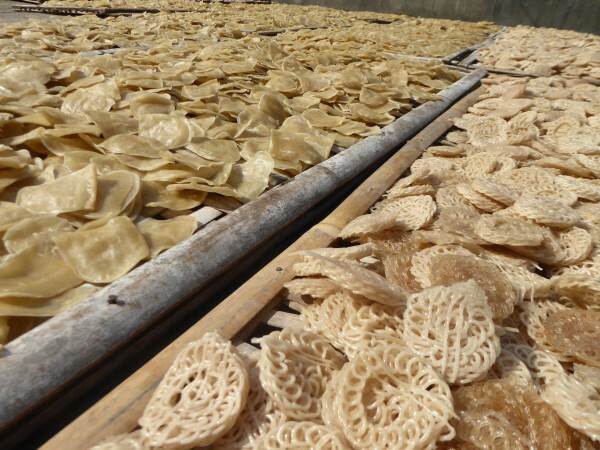 The secret ingredients are mixed together, and then squirted out into two different shapes, which are then laid onto bamboo trays and dried in the sun. 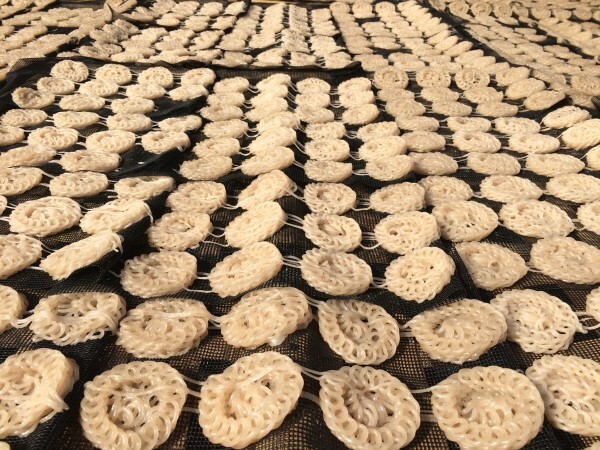 Once they’re dried, they’re broken into individual pieces, (see below). At this point its likely that cigarette ash enters the ingredients. They’re dried again in the sun. Then deep fried. And put into bags, which are then shipped to the cafe’s around abouts. Our next stop was a bank. We’re in the bank of this tiny Muslim village. Indonesia is a Muslim country, with Islam’s followers making up 86% of the population. (Christians make up 9% and Bali’s Hindu’s another 2%). 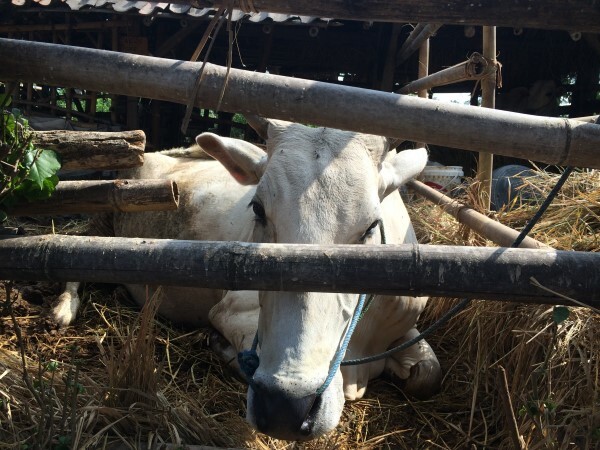 When families who live in this village (and it is typical of the area) want to make an investment, they apparently buy a cow. Some families here have several. This is their bank. 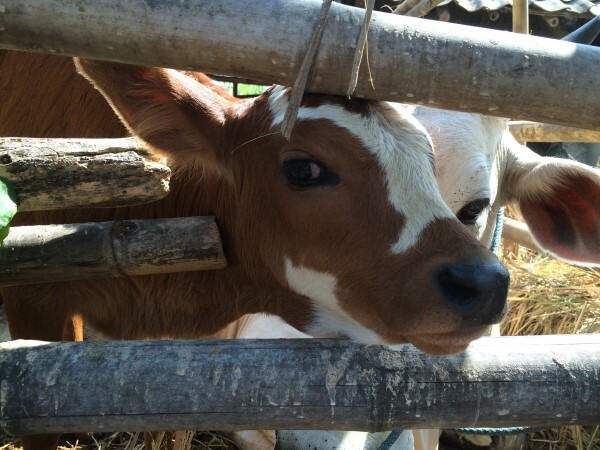 Their wealth is shown in the amount of their livestock. 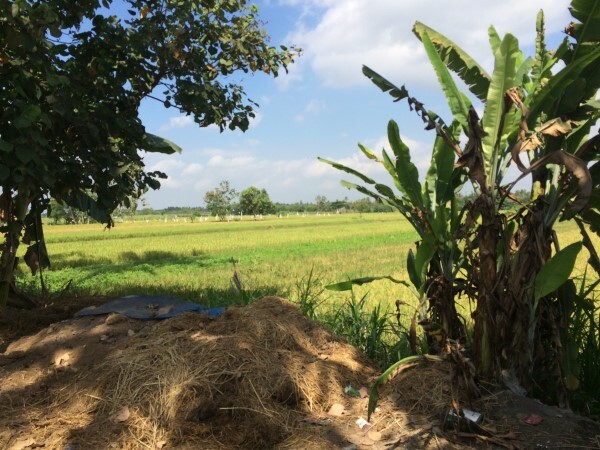 We’re surround by rice fields here in South East Asia. 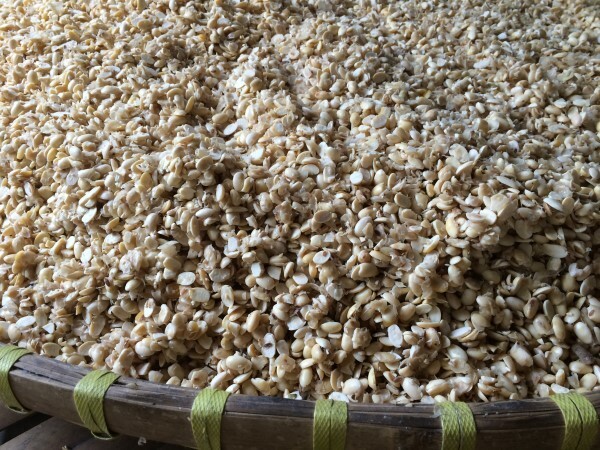 We’ve seen rice planted, grown and harvested, but this is the time we’ve seen it threshed. 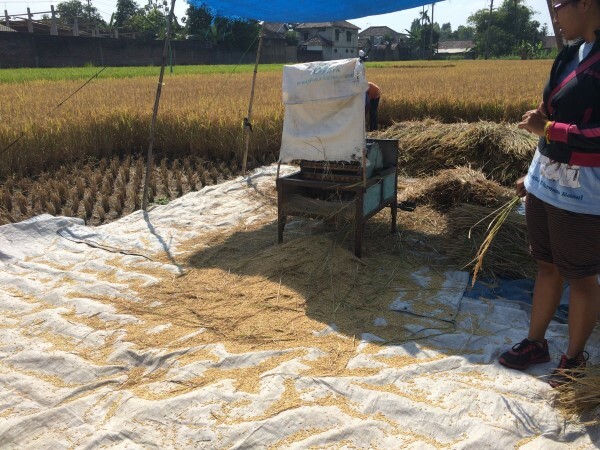 A couple are harvesting and threshing their rice. They’ve set up a tarpaulin shelter in the middle of the field, the husband is cutting the rice, and the wife is threshing. 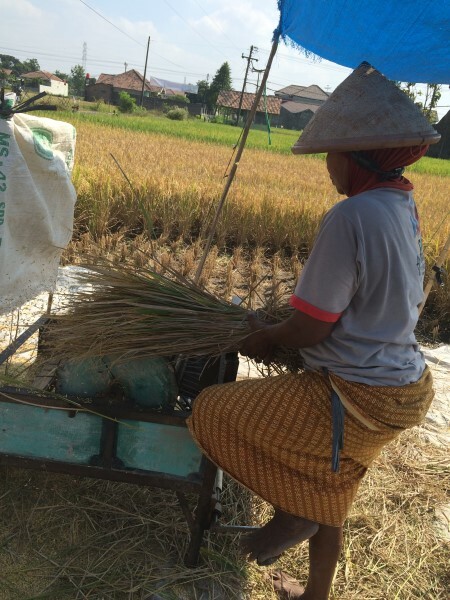 She has a peddle powered machine that drives a drum to bring he rice off the grass. It looks easy enough. We prove that its not. Just standing on one leg proves difficult enough. 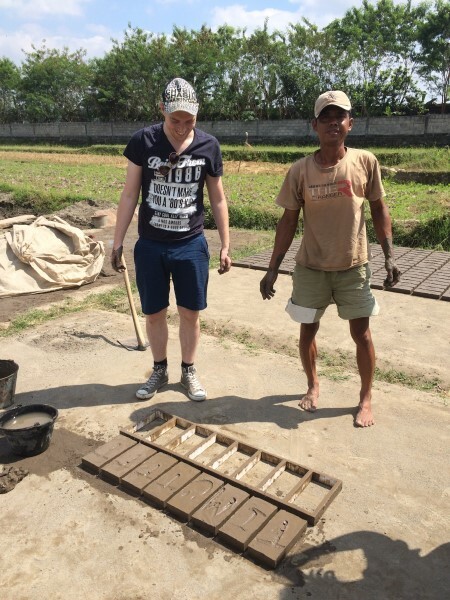 Coordinating enough to be able to hold the rice, and peddle requires concentration beyond both of us. 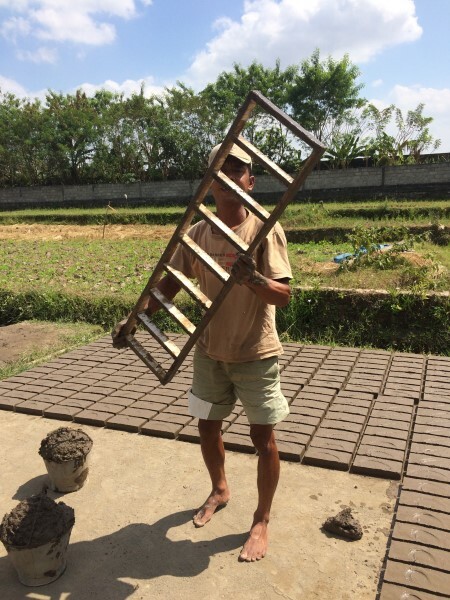 Rice is a love of manual labor. From the planting to the threshing here. 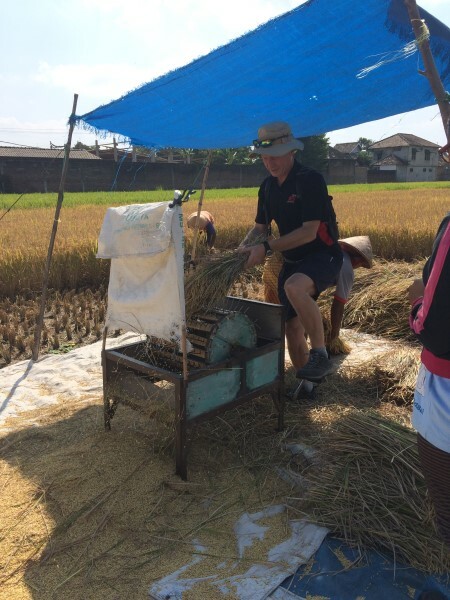 Earlier we saw the rice being harvested and threshed. 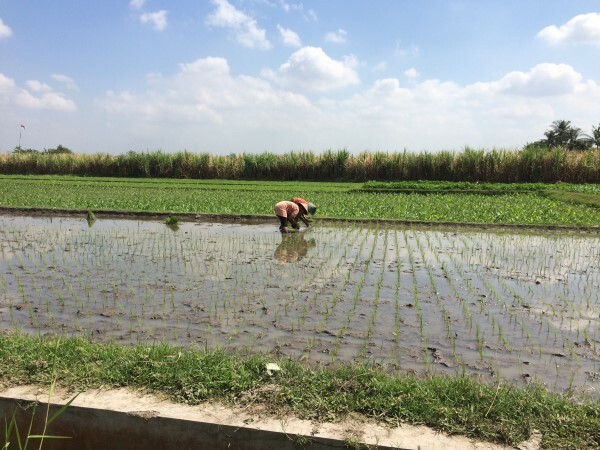 In many areas of South East Asia there are two even three rice harvests, and we’re offered the opportunity to join the women here planting rice into the paddy field. They’re fast. They’re stood in muddy water up to their mid calves. We might have had all our shots, but decline gracefully content to simply watch. 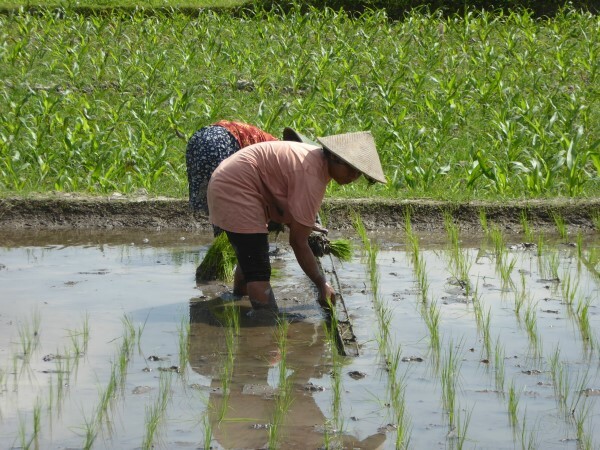 Land around all of South East Asia is planted with rice and Indonesia is no exception. 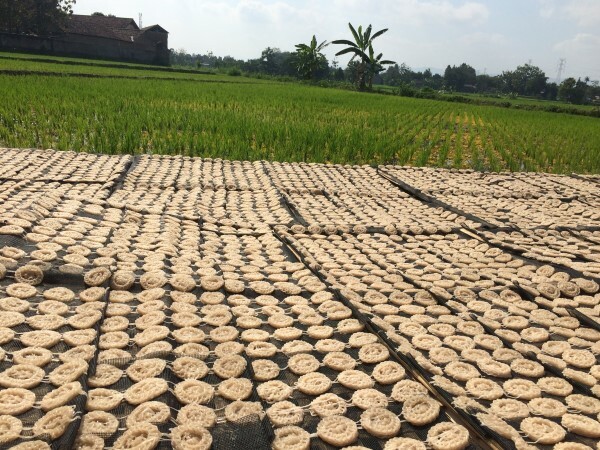 when the land tires of rice here south of Jogja the locals make bricks from it. 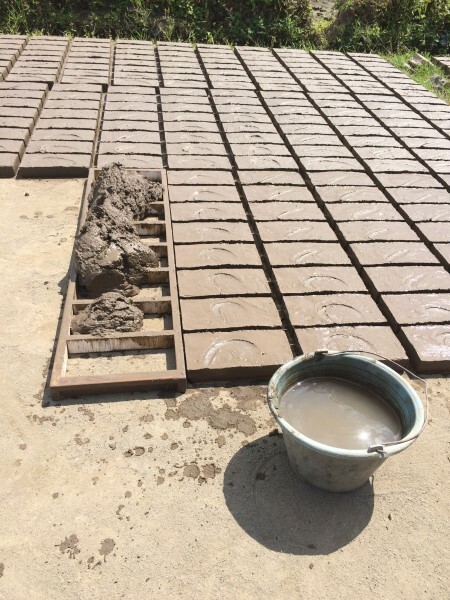 They scoop off several layers of the clayish mud and make it into bricks. 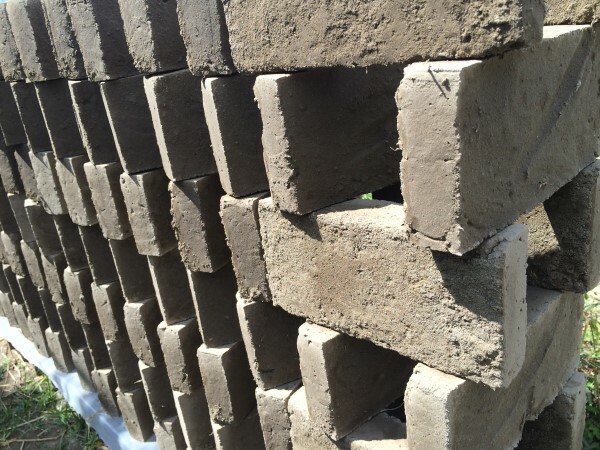 Our brick maker is quick. 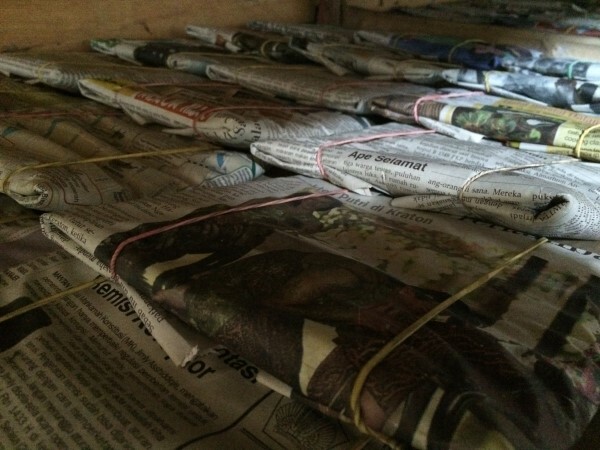 He has a basket of gloopy clay mud that he’s scooping, with his hands into his wooden frame. He pushes it in, scrapes it over, smooths it over and then with a final flourish signs his name onto it, also allowing a gap for mortar to take hold when they’re used in construction. 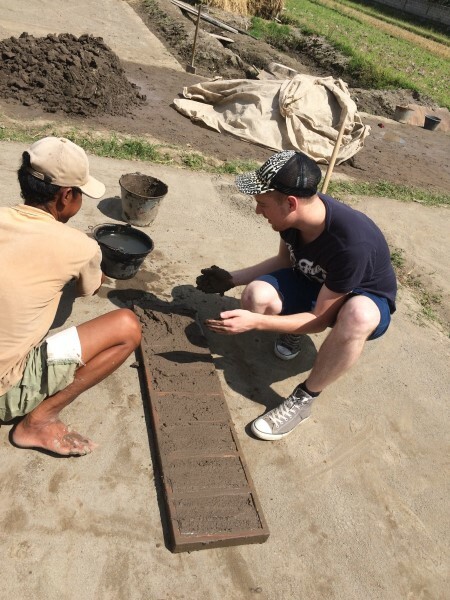 Tim, one of our groups has a go, proving that’s its an art and if we were to wait for him to make enough to build a house we’d be here a long time. 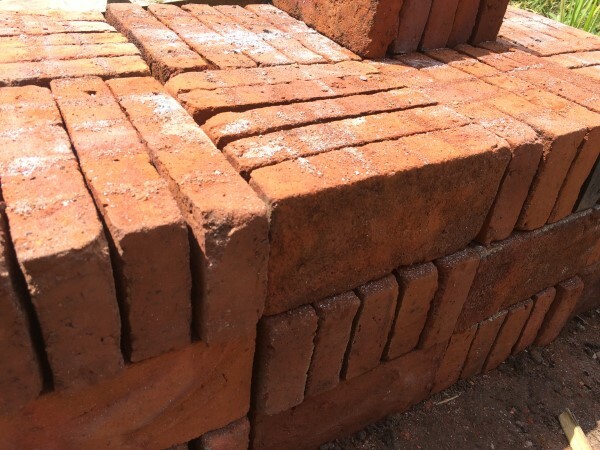 The bricks are dried here in the sun, then fired to turn the red that we see here. 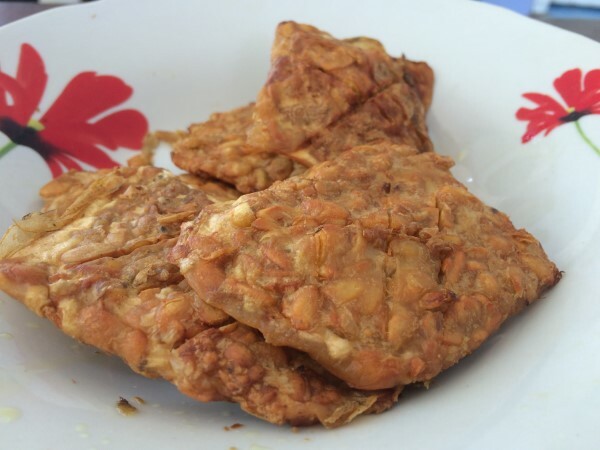 On the trip to Komodo and Rinca Island we discovered Tempe – fermented soy bean, which while sounding vile when marinated in a spicy sauce is damned good. This stop would show us how it’s made, and then we’d taste the results. 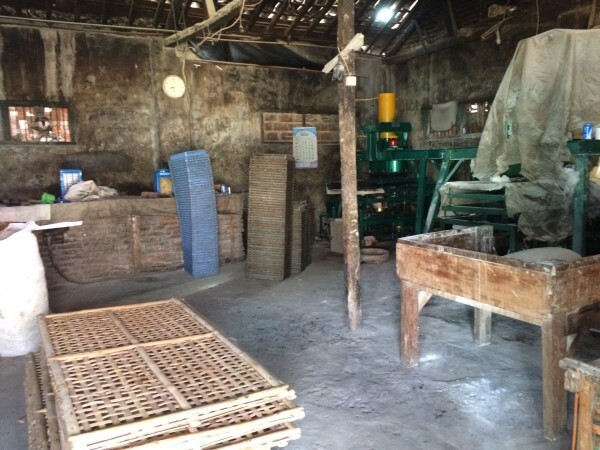 The soy beans used here in Jogja in this little “factory” on the side of a tiny lane on the outskirts of the city are imported from the USA, as they’re much better quality than those grown locally. First of all the soy beans are dehulled and cracked. Then, they’re soaked in water for up to 18 hours. 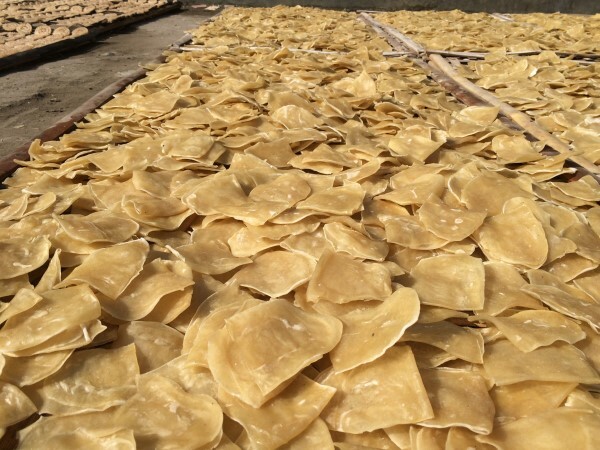 Then they’re drained and cooked with vinegar and then dried. 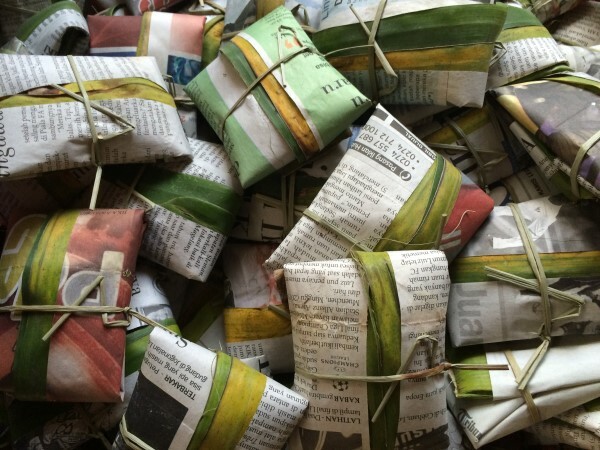 Then they’re mixed with “tempe starter” and left to ferment in squares or rectangles of bamboo leaf, wrapped up with newspaper. It takes 36-48 hours. That’s it. 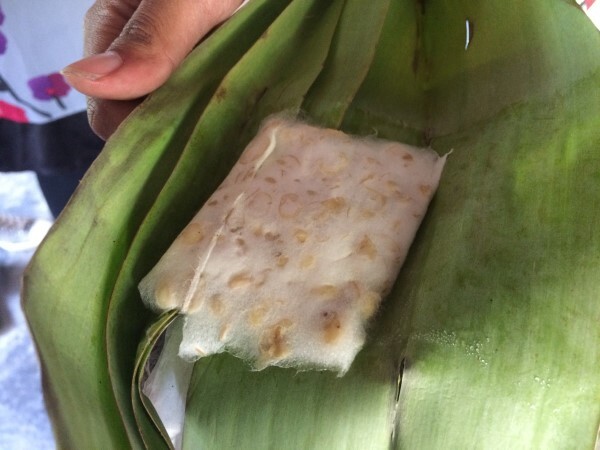 Our guide grabs a couple of ready packets and tells us to relax on the veranda, she’ll cook it up for us. She’s studying English at the local university and works on this tour to supplement her income while she works. During the holidays she takes this trip most days, now, while school is in session, just when she has the time. Her English is great and so too is her Tempe cooking. Fried up in a little oil with garlic and chili it’s moorish, and we clean the plate between us. Our primary reason for coming to Jogja was to visit Borobodur, but our jaunt south of the city has also been pleasant and so we’re off next and final stop Jakarta, via Bandung. When we travelled there was very little online booking available for buses, trains and ferries in Indonesia and South East Asia – the folks at Easybook have now remedied that – check timetables and book tickets online now – its WAY easier!